Amazon.com description: Product Description: A natural choice for the millions of people turning to a healthier lifestyle, this book invites readers on a sumptuously illustrated walk through the world garden to discover the story of some 250 food plants from field to table. 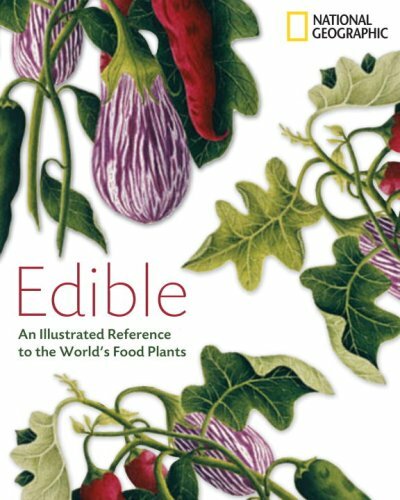 Illustrated with more than 500 images and written by top international horticultural and culinary experts, the sumptuous Edible explores the origins, history, and contemporary cultural and culinary uses of fruits, vegetables, nuts, grains, beverage plants, herbs, and spices. A rich introduction begins the book, revealing early agriculture and our "green" future. Then an eight-chapter "Food Directory" cameos individual plants, with reader friendly layouts framing each entryâs biography, botanical description, culinary role, and healing powers. In addition to the lively and authoritative narrative, Edible intrigues readers with layers of information: literary quotes, boxes on ancient origins of exotic foods, political underpinnings, nutritional values, longstanding remedies, and more. Tantalizing anecdotes dip into such diverse topics as the Japanese Cherry Festival; cacao, Mayan "food of the gods;" and the 17th-century Nutmeg Wars, which determined New Yorkâs future. A glossary and index complete the book. The National Geographic Desk Reference to Natureâs Medicine has proven itself a steady sales record. With huge appeal for both the health-conscious and the legions of devotees who follow todayâs chefs in the media, Edible is a recipe for success. About: A natural choice for the millions of people turning to a healthier lifestyle, this book invites readers on a sumptuously illustrated walk through the world garden to discover the story of some 250 food plants from field to table.